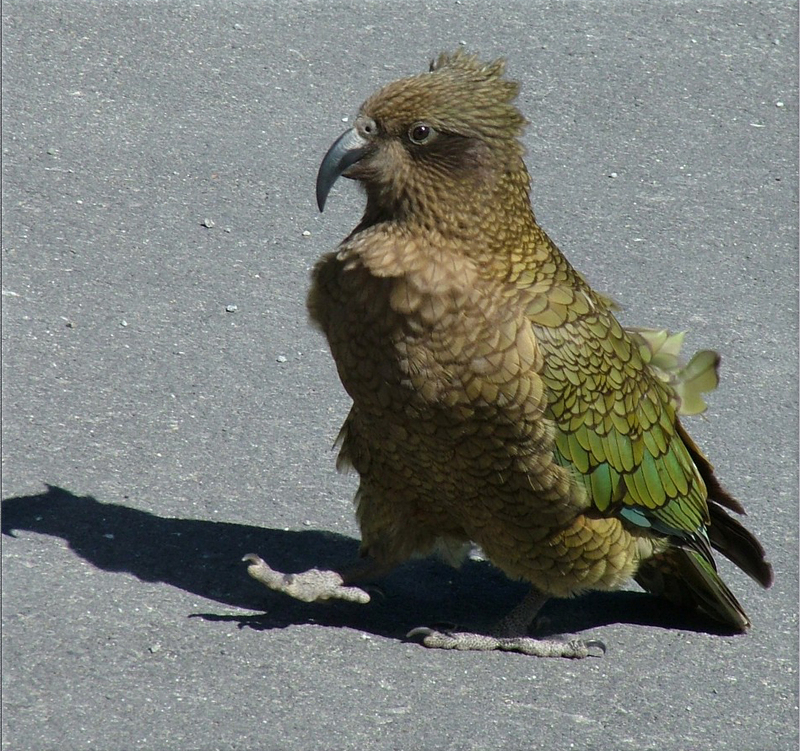 During my first trip to Mt Cook I met a man named Jussey from Austria who was studying Kea’s intelligence. He had done many studies on a captive population in Vienna and was now in New Zealand to repeat the same experiments with a wild population. After some in depth conversations about Kea I showed him some of the photos I had taken of the lovable parrot and he suggested we keep in touch. A few weeks after I returned home I got an email from him offering me a permanent job based down in Mt Cook taking over the Kea intelligence studies. My second trip to Mt Cook was my induction to the new job. It was mid autumn and absolutely freezing. I took the bus to Mt Cook village where I was to meet a Frenchman called Fabrice, who was doing the current Kea work. I found him at the hut, which would be our home for the next week, and he had some bad news from the get-go: he had lost his keys earlier that day while doing some Kea experiments. I wondered whether the Kea themselves had stolen them but Fabrice was adamant that they would be on the track somewhere so my first induction day was retracing Fabrice’s steps looking for his keys. We had no luck – which meant we had to walk – not drive – everywhere for the next week. This particular trip wasn’t just based around the hut; we had to do some serious walking in order to find Kea that had transmitters as part of the experiments. The one particular experiment which we did manage to get done began with two leaves. We would show a peanut to the bird and then put it under one of the leaves. We would then move the peanut under the leaf which previously had nothing under it while the Kea was watching. We recorded which leaf the Kea investigated first. We were interested to see whether the Kea was able to remember where the peanut was after having the position changed while it watched. They proved to be very smart and always went to the leaf where the peanut was. 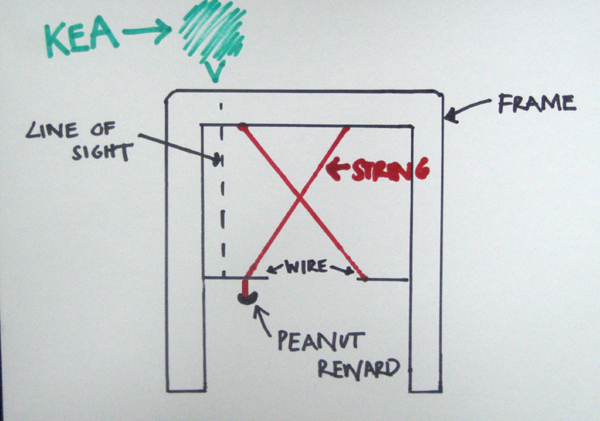 Another experiment that we were supposed to do but never had the opportunity basically involved having a small network of strings with one peanut and the bird had to determine which string to pull in order to get the peanut reward. It would have been interesting to see whether they could have figured it out but I personally have no doubt that they would have. Seeing as the kea weren’t coming to us, we decided to go to them. We packed up and started the long trek to the Muller Hut which is a notorious Kea hang out. It was a lovely, sunny autumn day and Muller Hut was about three hours walk from our hut. As the walk progressed the weather deteriorated: by the time we made it to the hut it was blowing a gale. We stopped there for a quick lunch and then realised that any flying thing would not be anywhere near this place in this weather, so we decided to head for home before it got even worse. We both struggled with the walk home; often being blown over by the severe winds. It’s hard to stay upright when you have a big pack on and the wind is blowing head-on at about 150km/h. Once back at the hut there was another native bird waiting for me in the toilet… A rifleman had flown into the long drop cubicle and was unable to find its way out. After some tricky manoeuvres I was able to catch it and release it – into a much more pleasant environment. I discovered where it had come from: there was a tree out the front of the hut that had a handful of New Zealand’s smallest birds within it and the rifleman headed straight for it. There were a lot of other species hanging around the hut at this time of the year, including a family of Paradise Shellducks, Harrier Hawks, a community of mice and the odd rabbit. I passed time in different ways on this trip. Being away from civilisation and artificial lights has its advantages when looking at the stars at night. Many hours were spent stargazing and trying to get a good photo of the star formations. My favourite pastime was enjoying the French cuisine that Fabrice rustled up; there were some good meals indeed. A week passed quickly and I did learn all that I needed to know. I returned home to hand in my notice at work, explaining that I would be taking a job down at Mt Cook. Unfortunately two weeks before I was set to move down to live in the mountains, Jussey (the man from Vienna) sent me an email explaining how there was not enough funding to finance my new position at Mt Cook and that there wouldn’t be a job for me after all. So there I was, resigned from my current job with no new job to go to. Fortunately I managed to get a job with the Department of Conservation in thhe Hawke’s Bay, where I am currently working. Things worked out perfectly because I am still able to use my annual leave to travel to the South Island and continue my work with Kea. hope there will be more stories from here,and diagrams hehe.really great writting, i hope there will be a book one day! !